I love green leafy vegetables. And any of you out there, if you’re planning to have a baby/just had a baby/expecting a baby, then green leafies are your best friend and even if you hate them you should find a way to incorporate them into your diet. Even if you hate babies and never ever want to have them, I still think it’s wise to include green leafy vegetables into your diet. Spinach day in and day out can get boring. And lettuce…well, you do get nice lettuce in India but I can’t trek to Nature’s Basket everyday to buy the stuff. I need something that’s just around the corner at my local grocer or sabziwallah. So: fenugreek (methi) it is! I never knew how many amazing health benefits fenugreek had till I incorporated it into my post-natal diet. It’s just a phancy way of saying, now that I’m a nursing mom, I eat methi everyday! Earlier, I’d usually have aloo-methi or methi paranthas, and once in a while methi dal (lentils with fenugreek.) Since fenugreek is bitter, it’s not a great option for a cold salad. And overcooking it in the form of aloo methi would also defeat the purpose. So my grandmom told me that you could just blanch it, and then with gently stir-fry it with a dash of oil, some thinly sliced garlic and salt. Ghee could replace the oil if you didn’t mind the calories. A spoonful of this, everyday, with rice, roti or just as is, would be good. 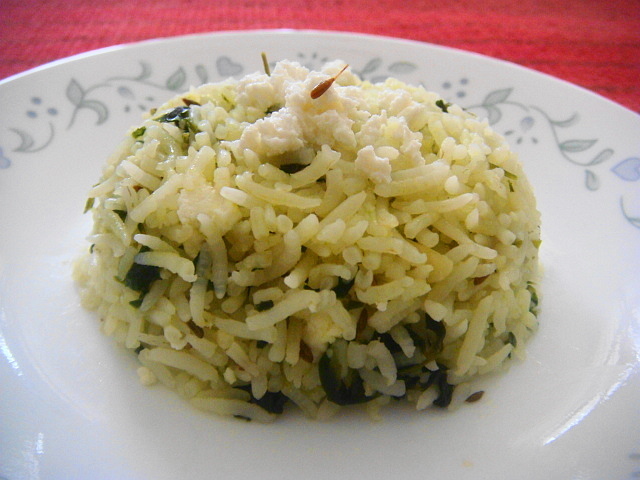 I took a whole bunch of methi and prepared it this way (using ghee, hee hee!) and I’d have a spoonful it at the start of each meal with roti or rice. There was a lot of it since I used a whole bunch of methi, so after 3 days of eating it like this, I decided to use the rest and make pulao. My inspiration behind this one is a cheddar apple herbed rice that Rachael Ray made. She cooked the rice and mixed in some assorted chopped herbs, sharp cheddar and apples. Which reminds me- she uses apples in a lot of her dishes on the show. Anyway, this dish doesn’t use herbs or cheddar but I liked the colour of Rachael’s rice, with green herbs peeking out between the grains. When I raided my fridge I found some leftover rice, chopped almonds and fresh paneer (cottage cheese) which I bought that morning. Then I just tossed everything together! I had about 1 cup of day-old steamed basmati in my fridge. 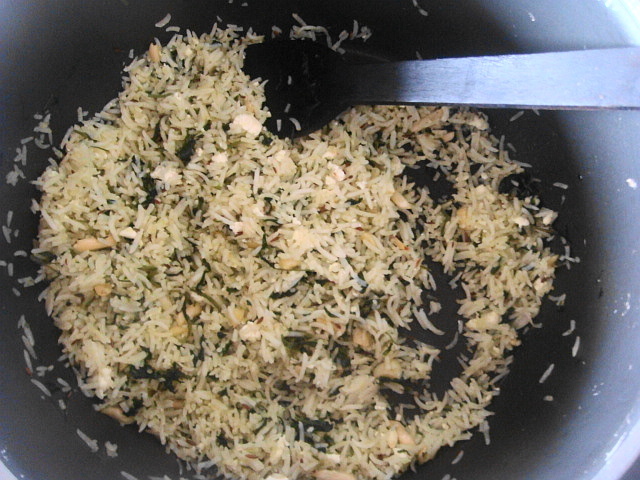 I added a teaspoon of ghee to my large wok, added in a teaspoon of jeera (cumin) and then added leftover rice. 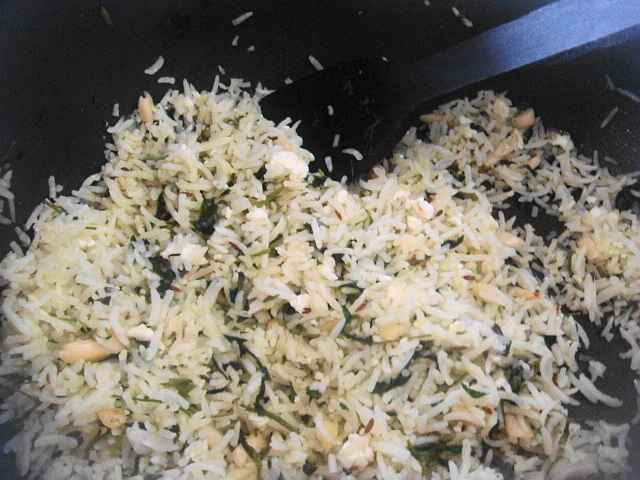 Once the rice was evenly coated, I added in the methi mixture (I think I had about 1 1/2 tablespoons of it left) and stirred in a fistful of crumbled paneer and some chopped almonds I had on hand. Salt to taste, and voila! In a wok, heat a tablespoon of ghee. Once the ghee is hot, add in the chopped garlic and let it soften. Then take the methi and wilt it in. Remove the mixture from the wok. In the same wok, add in 1 more tablespoon of ghee. Once hot, add in the jeera. Then add in the cooked rice. 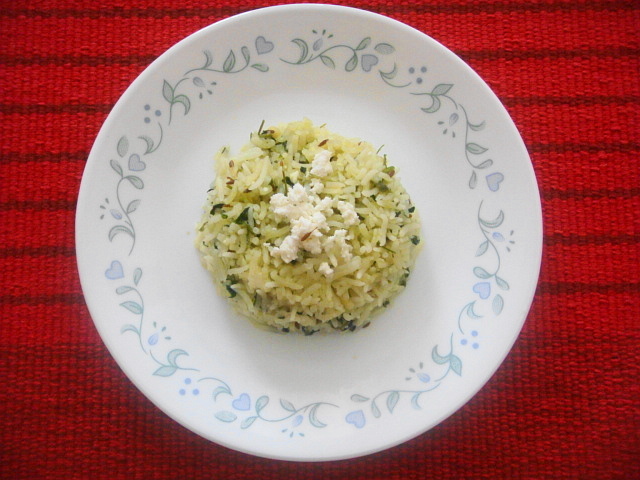 Once the rice is evenly coated, add the paneer, followed by the wilted methi mixture, some salt to taste and chopped almonds. Stir for a minute or two more and you’re done! P.S. Ok so I’ve been tryig to take better pictures and play around with plating up. I moulded the pulao like this and it collapsed on the other side! So much for trying. P.P.S. This post is a refrigerator raid. Refrigerator raids are when I make something that isn’t planned beforehand; I just open up my fridge and chance upon some ingredients and throw something together. So here goes. Mouth watering! You should see the program- “Chef at Home” by Michael Smith. He cooks on the “fly”, so to speak! Very creative with stuff he finds in his refrigerator. He does not cook to a recipe and some of his dishes are super tasty! You might get ideas for your “refrigerator raids” from his show! !